To make the right decision it’s very important to understand the information below. 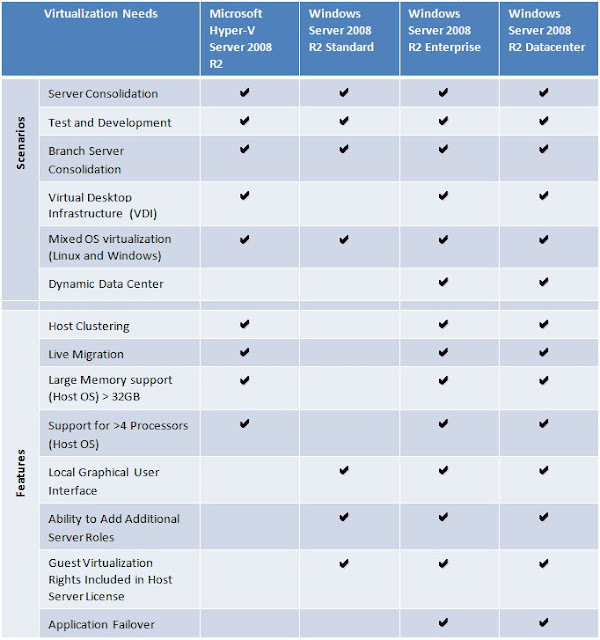 Customers should use Windows Server 2008 R2 to get application failover capabilities or flexible and cost-effective virtualization rights (one free virtual instance for Standard Edition, four free virtual instances for Enterprise Editions, and unlimited virtual instances for Datacenter Edition with the purchase of a license of Windows Server 2008), and flexible and cost-effective virtualization rights. You can use Hyper-V Server 2008 R2 for FREE (no license) it’s a kind of Windows 2008 R2 core version that can only be used as Hyper-V node. Advantages: Free to use, less management, less patch management and a better performance. Disadvantages: You need a license for each virtual Windows guest system. Copyright Henry Sluiman. Picture Window theme. Powered by Blogger.